Cheryl's Experience with Celiac Symptoms: My celiac symptoms started as a young child. I was taken to doctors for being severely constipated & run down, with pains, and extreme itchiness. I was put on what I call "band aid solutions" of all types of laxatives from chemical to prunes. I was on this diet for MANY YEARS...many years of what I called torture. I was taken off all these laxatives. I remember not eating any breads of any kind, my mother was mad, because I wouldn't eat sandwiches or anything that basically had wheat in it. I told her it was bread doing it to me, she told me I was SILLY!!!! I of course believed her. Being a young child, mother knew best. Then again back to this time the hospital for x-rays and the dye test. I think it was x-rays that showed I was severely backed up. The dye test didn't reveal anything. I was back on laxatives. This continued for YEARS!! Of course the docs asked my mom if she knew what was causing all this. My mother told him... she told me it's bread. I remember the smirk on the docs face, and he didn't do anything about it. Being young I started thinking this was all in my head, or my mother was just being cruel. I didn't know which. It wasn't until I moved out of home, being older, I knew something was really wrong with me. I eliminated ALL wheat flour based foods. I only ate fruit, vegetables and meats. WOWwwwwwwwwwwwwwwwww what a difference!!!!!! It took over a month or so to start feeling GREAT!!!! By now the internet was around, so I started looking, I did not get answers in the early 90's. But I knew I had a problem. I had been gluten/wheat free for a year or two, feeling the best I ever had. Then I decided to test...I wanted to be 100% sure it was something to do with wheat. Then one day I bought pizza.... OMG...back to the docs. I was backed up so bad again, the doc said she would have to......... not mentioning details , you get the pic, after hearing that, I refused!!! I was in AGONY.. I remember going to the pharmacy and buying a bunch of laxatives and getting funny looks. Laxatives which did not work. I ended up in hospital being relived of my problem. NEVER did the docs when I was young, & Docs when I was in my 20's even mention a possible disorder here. I was thinking, how can I be the ONLY person in the world with this problem!!!! So now I am 100% sure I can't eat anything wheat related. I just can't digest it. Last straw was when my problem caused internal injury. I remember saying in hospital...full of tears " I have lived with this problem ALL MY LIFE" Oh so this isn't new then....NO DUH!!!!! Then explained that every time I consume any wheat I end up this way. I was FINALLY diagnosed after blood tests for it. The doc told me the biopsy wasn't required....as the symptoms were very evident, and past history/tests which I had supplied him with after chasing down my family doctors. I was SHOCKED... that there was no magic pill for this condition. I was also shocked that I had been doing the right thing for the majority of my life when no one else had a CLUE about it. I remember calling my mother...and asked her "Do you remember when I was in and out of hospitals and doctors for YEARS, and lived on laxatives because I thought it was bread causing it, and you called me SILLY..and kept saying don't be silly there's no such thing?" Of course she said yes... then I said "Well...I was smarted than the doctors, surgeons, and you!!" I have Celiac disease you might want to look it up". I was so mad she didn't listen to me all those years. I was force fed if I didn't eat something, I assume I was under weight. I still slip into "oh I have to have some of that" I eat a little, just so i don't get constipated. I understand I reverse all the work i have done in avoiding the catalyst for my problems. My thinking is, as long as i don't get constipated or pains, I'll eat some wheat, not everyday though. If I have a half a sandwich I also eat something that does agree with me, to minimize all the symptoms. I can eat oats with no problems, I can eat cereals with no problems. Well...what I mean by no problems , I mean I don't get constipated by those, or feel run down. I do itch ALOT, and get small hives after I itch always AFTER I eat anything wheat related. But I do know if I eliminate all wheat related goods for a month or two, i sure feel AWESOME!!! Thanks for sharing your story, Cheryl. I've shared some of your symptoms since I was young. I was in severe pain and I was told I had a "spastic colon". Now doctor's say it's Irritable Bowel Syndrome. After it was recommended that I stop eating gluten, I began feeling better, and I don't want to go back! Glad you finally found out what was going on. Like to bake? Don't let being gluten free stop you from enjoying the best! 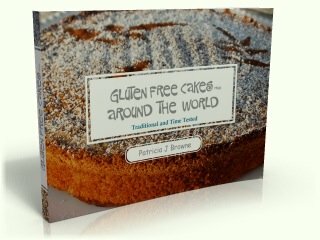 This eBook has an amazing collection cake recipes that have been historically gluten-free from various cultures around the world. Many recipes are grain-free and dairy-free as well. There are recipes of all kinds: flourless, grain free cakes and cakes with grains like rice and corn. Almond flour recipes and nut-free recipes. Chocolate, orange, lemon, almond, cinnamon: many mouth-watering flavors, many traditions. The book I wish I had when I switched to living gluten free. What are the Celiac Disease Symptoms? Join in and write your own page! It's easy to do. How? Simply click here to return to Stories of Celiac Symptoms.